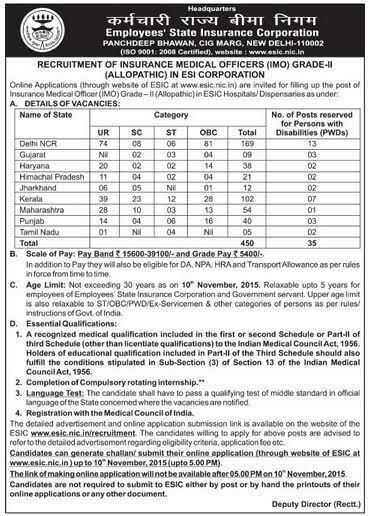 Applications Are Invited For Insurance Medical Officers (Allopathic) Posts In ESI Corporation's Hospital And Dispensaries Located In All Over India. Insurance Medical Officer (Allopathic) IMO Grade II - 450 Posts - Basic Pay 15600 Grade Pay 5400 with NPA in Pay Band III category - MBBS with valid registration of MCI - Age 30 years. PH quota is applicable in this recruitment. 35 Posts are allotted for PwD Quota. Cut off date for age calculation and essential qualifications, experience are 10.11.2015. Application Fee Rs.300 for UR and OBC category applicants. Major Cities in Delhi, Gujarat, Haryana, Himachal Pradesh, Jharkhand, Kerala, Maharashtra, Punjab and Tamil Nadu States.